This post will explain how the Power BI content pack can help you analyze your Xero data. 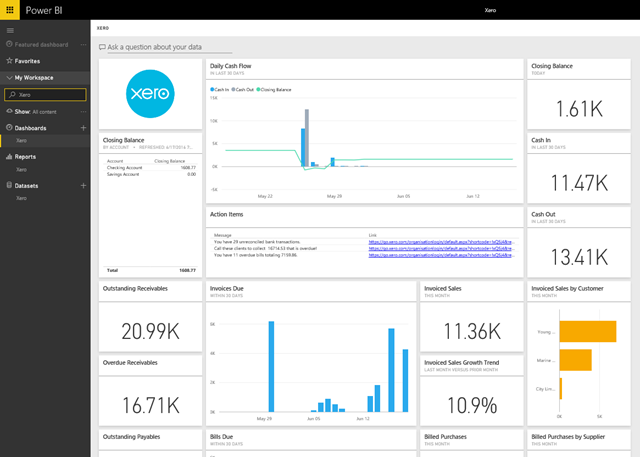 For additional details on how to get started, please see the Xero content pack for Power BI help page. To connect to the content pack simply provide your Xero credentials. 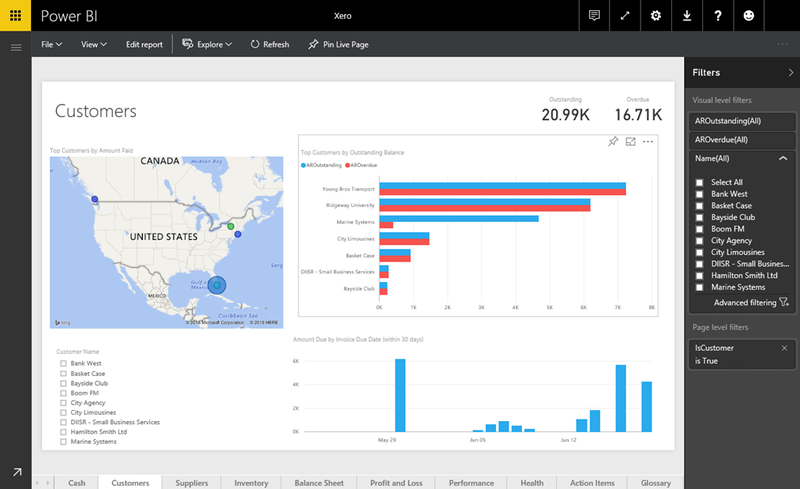 Once the connection is completed, Power BI will automatically create an out-of-box dashboard, report and dataset with data from Xero. The dashboard is the initial landing page and offers an overview of the insights included in the content pack. You can select any of the tiles to drill into the multiple pages of reports behind the dashboard, for example selecting in the “Invoices Due” chart will take you to the Customer report, showing outstanding balances, invoice due dates and more. In the report you can hover over the visualizations for more details. Selecting a visual will cross filter the rest of the page to provide additional insights between the related metrics. The filter pane on the right offers page and visual level filters to drill into the data further. You can also switch to edit mode to customize the reports by changing or adding visuals. On the right, you’ll see a list of all the tables and fields you have access to in the content pack. The Xero content pack includes 13 different data tables and selecting any visual will show the fields used for that metric. From any of the reports you can pin the visualizations or tiles to the dashboard by hovering over it and selecting the pin icon. Pinning the visuals will prompt you to select a dashboard to pin to, allowing you to customize and bring in data from multiple sources. After the initial import, the dashboard and the reports continue to update daily. You can control the refresh schedule on the dataset. The Xero content pack for Power BI provides an initial set of insights on the dashboard and in the reports to help understand your data even further.